When you are involved in an automobile accident in the State of Florida, several laws come into play. Some of these laws are unique to Florida, which impact both the at-fault driver and their victims. 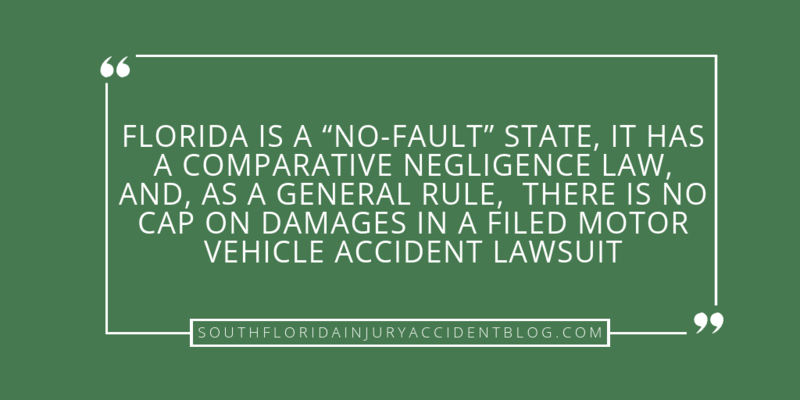 For instance, Florida is a “no-fault” state, it has a comparative negligence law, and, as a general rule, there is no cap on damages in a filed motor vehicle accident lawsuit. Here is a general overview of the legal issues involved with filing a car accident lawsuit. In Florida, automobile accident insurance is required by law. The Florida Financial Responsibility Law, requires every driver to have full liability insurance coverage in the event of a crash. In fact, the Bureau of Motorist Compliance checks for active car insurance coverage whenever a motor vehicle is registered in the State of Florida. The reason why car accident insurance is mandatory in Florida is because our lawmakers believe mandatory insurance coverage helps protect the public by ensuring that they can pay for any damages they may cause in a car accident. This also means that after most car accidents in Florida, accident victims will have to deal with an insurance adjuster, insurance company investigator, and sometimes, a defense lawyer paid by the insurance company to represent the at-fault driver. What vehicles are not considered a “motor vehicle” in Florida? In Florida, “motor vehicles” must be insured. So, what is a “motor vehicle” under Florida law? (b) A recreational vehicle-type unit primarily designed as temporary living quarters for recreational, camping, or travel use, which either has its own motive power or is mounted on or drawn by another vehicle. Notwithstanding this law, a victim can still sue for damages sustained in an accident involving a moped, or bicycle, or swamp buggy (as well as these other kinds of vehicles). Indeed, some of the injuries sustained in these kinds of accidents can be severe, life-altering, or deadly. For those accident claims not involving a “motor vehicle,” standard personal injury law will apply. One important issue here is whether or not there is vehicle-specific insurance coverage. Meaning, does the at-fault driver have insurance coverage for an accident caused by a moped, or bicycle, or swamp buggy or other kind of non “motor vehicle” vehicle. Preparation and filing of the lawsuit complaint and the filing of an answer by the defendant. In some instances, the defendant will move for a summary judgment. A Motion for Summary Judgment is essentially when the defendant denies that he or she is liable in any way for the subject car accident (meaning, there are no facts in dispute) and requests that the judge dismiss the case as a matter of law. Discovery – There are several ways to produce discovery in an auto negligence action. This can be done through Interrogatories, Request for Production, Request for Admissions, etc. Additionally, a party in the case (or their respective counsel) can request that a party appear to take testimony under oath. This is called taking a Deposition. The discovery process is the period of time in the lawsuit where the parties gather as much information and evidence as they can to prove their liability, or lack of liability, and damages. Mediation or Settlement Conference – This is where both parties meet (usually with a third party mediator) to discuss their sides of the case in hopes of entering into a settlement agreement. If a settlement is reached, the lawsuit will end here, and the agreed upon compensation will be distributed accordingly. If not, the case will then move to Trial. Trial – During trial, the jury will evaluate the admitted evidence in order to decide issues of liability and damages. Throughout the trial, and sometimes before the trial begins, the judge gives the Jury instructions on how to make these important decisions. The Florida Supreme Court approves standard jury instructions that are to be used in all civil actions. While the lawyers have some say in what instructions are to be given in their “charge conference,” the judge decides what the jury hears. how to fill out the verdict sheet at the end of the trial, which will include a juror’s final opinion of fault. Where Do You File a Florida Car Accident Lawsuit? In Florida, the car accident lawsuit must be filed in the county where the accident occurred. In some situations, you can file in the county where the defendant resides. The jurisdiction and venue of each case must be decided based upon its unique circumstances. Should You Be Concerned About Filing A Lawsuit? Often, insurance adjusters have a bias against the accident claim simply because of the type of crash involved. This is made clear when an insurance adjuster makes a low ball offer or denies a legitimate accident claim based upon their personal assessment of the accident. For many, the thought of filing a lawsuit can be overwhelming. However, an experienced car accident lawyer should help alleviate this stress by spending time with the victim and explain how the law works, what their options are in terms of recovering compensation and the steps involved in a lawsuit. Most victims do not want to be re-victimized by an insurance adjuster or defense attorney. Your attorney should make sure that doesn’t happen! After a car crash, the accident victim may need to sue more than one party for damages. That’s because more than one party may be legally responsible for the accident. Defendants in a car accident case may include the driver of the motor vehicle who hit you, as well as his employer, or the owner of the vehicle (if different from the driver). There may be occasions where the government is a defendant in the car accident lawsuit, too. In these situations, “sovereign immunity” exceptions must apply in order to hold the governmental agency or entity liable for damages. See: Car Accidents With Company Cars or Commercial Vehicles: What is Respondeat Superior? In Florida, there is a law that sets a deadline for filing a car accident lawsuit to recover damages from a car crash. If you do not file your lawsuit by the statutory deadline, then you will be barred from having your day in court. Which means even if the clerk accepts your lawsuit filing, the defendant can quickly move the court to have the lawsuit dismissed. Florida Statute 95.11(3)(a), states that any action founded on negligence must be filed within 4 years from the date of the car accident. This law is commonly referred to as a “statute of limitations” but it is formally known as a “limitations of action” law. A car accident victim has four years from the date of the crash to file a lawsuit to get compensation. However, loved ones seeking wrongful death damages have a stricter deadline. They have two years to sue for wrongful death under the Florida Wrongful Death Statute. For more, see: How do statute of limitations work? Unlike many other states, we have a comparative negligence law that applies to car accidents. A victim should be aware of this law because it impacts the amount of compensation a victim may receive for their car accident related injuries. Comparative Negligence allows the defendant to argue that the accident victim shares in the responsibility for causing the crash. According to the law, because the victim is partly to blame, the defendant will not have to pay for that percentage of the accident that was the victim’s own fault. With comparative negligence, fault of the accident boils down to percentages. Meaning, the percentage of fault allocated to the victim is deducted from the amount of damages awarded by a jury. the result of that second calculation is the amount that the victim receives from the defendant’s insurance company. As a matter of public policy, Florida applies a “no fault” theory to auto accident claims. However, this does not mean that at-fault drivers are not held accountable for causing a car accident. What Florida no-fault laws provide is that the victim’s medical costs and lost wages are covered by the victim’s own insurance carrier, regardless of who caused the crash. The at-fault driver who causes the crash also files a claim, but with their own insurance company for emergency room visits and for other car accident related expenses, including medical expenses. This is how Personal Injury Protection or “PIP” coverage works in Florida. PIP coverage, pursuant to Florida law, states that you must carry $10,000 as your minimum auto accident injury coverage and another $10,000 in coverage for property damage. There is a 14 Day Deadline to go and see a doctor after a car crash. This applies to the driver and to any passengers. If you fail to get medical care within two weeks of the crash, you have missed the deadline. Only certain health care providers are covered by PIP. Massage therapists are not covered. Acupuncturists are not covered. Are There Requirements To File An Auto Accident Lawsuit For Pain and Suffering Under Florida’s No-Fault Law? Accident victims can sue the at-fault driver (who caused the car crash) for their pain and suffering and other damages. However, Florida’s No-Fault Law only allows lawsuits if the victim has serious damages. What Damages Can You Recover in a Car Accident Lawsuit? In a Florida auto accident lawsuit, you can claim two kinds of damages: economic and non-economic damages. Economic damages in a car crash are those kinds of expenses and costs that can be easily documented, (i.e. paperwork to attest to their amounts.) They include things like lost wages and hospital bills. Non-economic damages are things that are real harm to the accident victim, but do not have paperwork to easily confirm their cost. The most common example of non-economic damages in an auto accident is pain and suffering damages. If loved ones are pursuing a claim for damages after the accident victim has died, then the Florida Wrongful Death Law applies and defines not only who can sue, but how much they can be paid in wrongful death damages. Laws have been passed in Florida that limit, or cap, the total amount of damages that can be paid to an accident victim in a Florida Lawsuit. The limits cover certain kinds of damages. As a general rule, there is no damage cap that applies to your Florida Auto Accident Lawsuit. Practically speaking, most often judges and juries will tally economic damages and then decide the non-economic damages as a multiple (two times, three times) of that amount. If you sue the doctor for damage done to you during treatment of your auto accident injuries, then that is a separate medical malpractice case and it will have medical malpractice statute limits on damages you can be awarded. If you sue a drunk driver for injuries you suffered in a drunk driving crash, then the jury can award you punitive, or “punishment “ damages. These are non-economic damages that you don’t have to prove with evidence. The jury can decide the amount of punitive damages it wishes to award. However, there is a Florida law which puts a cap on punitive damages. If the jury award exceeds that cap, then you will be limited to getting the amount of the cap. See Florida Statute 768.73. A good piece of advice if you or a loved one are injured in a car accident and you are unable to settle your case, is to speak with an experienced car accident lawyer to learn about some of the issues that can arise with filing a lawsuit, including settlement conferences or mediation, depositions, interrogatories, and the actual trial. Most car accident lawyers, like Alan Sackrin, will offer a free initial consultation (over the phone or in person, whichever you prefer) to answer your questions.